Reduce your turkey cooking time by roasting it in an oven bag. 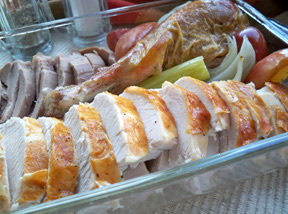 Not only will you cut turkey cooking time down but you will also end up with a super moist and flavorful turkey. Preheat the oven to 325 degrees. Remove neck and giblets from the cavity of the turkey. Rinse the turkey inside and out with cold water. Pat dry with a paper towel. Sprinkle turkey inside and out with salt and pepper. Tuck wings under turkey. Oil the turkey with olive oil and salt and pepper. Place turkey in an oven roasting bag. Scatter onions, celery, apple sections and garlic over and around turkey. Add 1/2 C of water to the bag. Tie the top of the bag and make a slit in the center of the bag and place into a roasting pan breast side up. 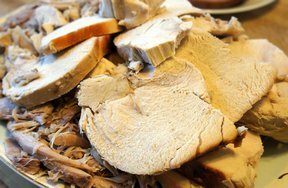 Roast turkey 3 to 3 1/2 hours, or until a meat thermometer inserted in the thickest part of the leg (but not touching the bone) reaches 165Â° F. to 170Â° F.
Carefully tear open and remove the bag. Increase the oven temperature to 450Â° F. Roast 30 minutes longer, or until the thermometer registers 180Â° F., basting with the pan juices every 5 minutes. Turkey should be golden brown. Remove the roasting pan from the oven and carefully transfer turkey to a platter, letting the juices run back into the pan; reserve the juices for gravy. Cover the bird with foil and let stand for 20 minutes before carving. 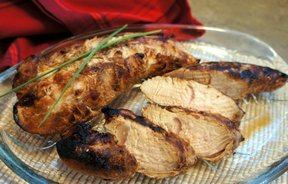 "I used this recipe for our Thanksgiving turkey. It was super moist and I cooked a 20 lb. turkey and it was done in 2 hours and 15 minutes. I couldn't believe it! I will definitely fix our turkey like this again."